Weight change and heatflow measured under perfect identical test conditions with a TGA/DSC deliver more information about composition, phase transitions and chemical reactions. The modular systems can be configured to current and future needs with micro- and ultramicro-balances, various furnaces types and SDTA, DTA and DSC sensors. Automated evolved gas analysis is easy with TGA-FTIR, TGA-MS and TGA-GC-MS hypenation. Thermogravimetric Analysis (TGA) is a technique that measures the change in weight of a sample as it is heated, cooled or held at constant temperature. Its main use is to characterize materials with regard to their composition. Application areas include plastics, elastomers and thermosets, mineral compounds and ceramics as well as a wide range of analyses in the chemical and pharmaceutical industries. The heart of a Thermogravimetric Analysis system is the balance cell. 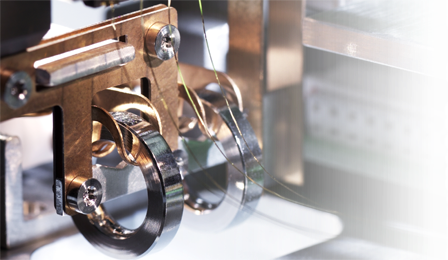 Our TGA instruments use the world’s best METTLER TOLEDO micro and ultra-micro balances. The internal calibration ring weights ensure unsurpassed accuracy. You can also calibrate and adjust your balance with external weights. No other TGA can measure up to 50 million resolution points continuously – weight changes of a 5-gram sample are determined to 0.1 µg. This means you can measure small and large samples with the same high resolution without having to change the weight range. The parallel-guided balance ensures that the position of the sample does not influence the weight measurement. If the position of the sample changes during melting, no change in weight occurs. The horizontal furnace design helps minimize possible turbulence caused by thermal buoyancy and the purge gas. The gastight cell can be evacuated and purged with a defined gas atmosphere. A controlled closed system with precisely defined conditions like this is essential to obtain unambiguous information and quality results. All TGA versions can be connected online to a mass spectrometer, an FTIR spectrometer or a GC/MS system. Analysis of the gaseous decomposition products yields additional information about the sample. This enables you to interpret measurement curves with greater certainty. The TGA/DSC 3+ provides trustworthy results using a TGA balance from the worldwide leader in weighing technology with position-independent weighing, automatic internal calibration weights, a wide measurement range, the best minimum weight performance and the highest weighing accuracy and precision. It allows users to analyze a wide variety of sample types up to 1600 °C. A complementary DSC heat flow sensor simultaneously detects thermal events such as melting and crystallization in addition to providing accurate and precise transition temperatures. No other TGA can measure up to 50 million resolution points continuously – weight changes of a 5-gram sample are determined to 0.1 µg. This means you can measure small and large samples with the same high resolution without having to change the weight range. The DSC sensor is based on the unique MultiSTAR® sensor amplification technology. The six thermocouples generate a larger measurement signal, which improves the signal-to-noise ratio. With all three types of sensors, the heat flow is determined from the calculated or measured temperature difference. As with a dedicated DSC, the heat flow is calibrated and adjusted at different temperatures using certified reference materials. The unique One Click™ function allows you to safely and easily start predefined measuring methods directly from the instruments’ color touchscreen display. This facilitates the processing of routine measurements by production staff in quality control significantly. Influence of Carbon Black on the Glass Transition Using thermal analysis techniques to demonstrate the influence of carbon black on the glass transition of elastomers using an EPDM as an example. What Can Model Free Kinetics Tell us About Reaction Mechanisms? DMA Measurements in Humid Atmospheres Testing materials in relative humidity environments by dynamic mechanical analysis (DMA). Curve interpretation Part 6: Variation of DMA measurement conditions DMA measurements can be performed under very different conditions to characterize the mechanical properties of materials. A great deal of information about a sample is obtained when the temperature, frequency or displacement amplitude is varied. The mechanical properties of composites or anisotropic materials can only be fully described by varying the direction of the deformation measurement or by using other measurement modes. This article discusses a number of typical examples. Determination of weak glass transitions in semicrystalline polymers The glass transition of semicrystalline polymers is often weak and difficult to measure by DSC. In this article, we show how a glass transition step of less than 0.1 J/g·K can be reproducibly determined using the DSC. The sample investigated was isotactic polypropylene (iPP) with a degree of crystallinity of 50%. Identification of an unknown polymer sample using TGA-GC/MS The TGA-GC/MS system can be used to investigate the composition of unknown samples. This is done by installing the IST16 storage interface between the TGA and the GC/MS. The interface allows up to 16 evolved gas samples to be stored at different furnace temperatures during the TGA measurement. The gas samples are analyzed and identified by GC/MS when the TGA analysis is finished. This article describes how a black polymer granule was characterized using this technique. The thermal decomposition of PA 6.6 compounds using model free kinetics (MFK) Kinetic calculations based on TGA measurements of PA 6.6 compounds were performed to assess the influence of additives on the course of thermal decomposition. Dynamic mechanical properties of thin adhesive joints The mechanical properties of polymer-metal adhesive joints were studied as a function of the thickness of the adhesive layer using DMA. The glass transition temperature and the effective crosslinking density were evaluated from the shear modulus measurement curves. The results show that both quantities are strongly dependent on the thickness of the polymer layer. This is due to the formation of an interphase in the contact region of polymer and metal. The properties of the interphase depend on the metal used. Curve interpretation Part 7: DMA combined with results from other thermal analysis techniques DMA measurements provide many different possibilities for characterizing materials. This article shows how DMA in combination with other thermal analysis techniques can be used to comprehensively characterize materials using different polymers as examples.measurement modes. This article discusses a number of typical examples. Safety analysis of a nitration reaction by DSC and reaction calorimetry Safety is an important aspect in process development in the chemical industry. This article, describes how reaction calorimetry and DSC can be used to quickly assess the thermal hazard potential of chemicals and chemical reactions. Flame-resistant rubber blends - a new approach for optimizing properties In many applications, such as in cables or seals, rubber blends must possess both excellent mechanical properties and good flame-resistant properties. This article shows how flame resistance can be easily determined by TGA measurements and how the combination of mechanical and thermogravimetric measurements can be employed to optimize properties. Curing reaction of a two-component methacrylate sample by UV-DSC Photopolymerization is nowadays a widely used process. Systems are used for medical applications, for example in dentistry, for adhesive applications, in coating technology, and quite recently for 3D printing . This article describes how the curing behavior of a two-component UV-curing sample can be investigated. Quality control of lipstick and mascara by thermal analysis Many different sorts of lipstick and mascara are nowadays available. The most important characteristics of these products are that the effect lasts a long time, that the products are easy to apply and easy to remove, and that they are physically and chemically stable and do not irritate the skin. The waxes and oils in lipstick are responsible for ease of application; carbon black is often used as pigment in mascara. Thermal analysis techniques allow the quality of these types of cosmetic products to be easily checked. Synthesis of tricalcium phosphate as bone replacement material Tricalcium phosphate (TCP) is one of the main constituents of bone replacement materials which find wide use in medical and dental applications for bone grafting and for implants. This article shows how TGA/DSC and TMA can be used to investigate the synthesis of tricalcium phosphate and to determine the transition temperatures of different TCP polymorphs. Characterization of polymer-coated TiO2 particles by TGA and DSC When polymeric binders are used in paints with hydrophilic pigments such as titanium oxide, the pigments must be treated beforehand with polymers that are compatible with the binder. Otherwise, large agglomerates can form due to poor adhesion between the binder and the particles. This can lead to brittle films and fractures in the paint coating. This article shows how TGA and DSC can be used to determine important properties of the coating using titanium dioxide as an example. Identification of thermoplastic polymers: melting point analysis by DSC For many practical applications, it is important to be able to quickly and reliably identify polymers. This article describes how semicrystalline polymers can be identified by measuring their melting points using DSC. Thermogravimetry and gas analysis, Part 1: Basic principles and overview A thermobalance coupled to a suitable Evolved Gas Analysis (EGA) system allows qualitative information to be obtained about the gaseous reaction or decomposition products formed in a TGA experiment in addition to purely quantitative information about mass changes. 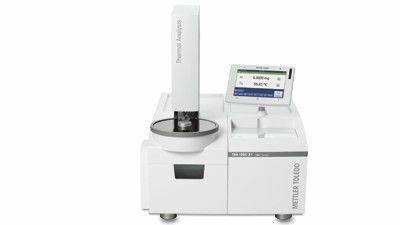 This new series of articles discusses the various measurement techniques that METTLER TOLEDO offers for such analyses. Dynamic mechanical characterization of elastomers in oil at temperatures up to 200 °C The fluid bath DMA 1 option allows the influence of swelling on the dynamic mechanical properties of a sample to be measured in the temperature range 0 to 200 °C. This means that deformation conditions of components that are in direct contact with fluids can be simulated (for example drive or timing belts that permanently run in motor oil). Determination of the glass transition temperature of difficult samples by Flash DSC Crystalline pharmaceutical substances often decompose immediately before or during melting. To determine the glass transition temperature, the substance must be melted and then cooled as rapidly as possible so that decomposition and crystallization do not occur. In many cases, the heating and cooling rates of conventional DSCs are not high enough for this purpose. The METTLER TOLEDO Flash DSC however offers new possibilities. This is illustrated in this article using prednisolone as an example. Strategies for separating overlapping effects, Part 1: DSC The interpretation and quantitative evaluation of thermal analysis measurement curves is difficult when several effects take place simultaneously. A number of methods are available that can be used to separate overlapping effects and analyze them individually afterward. Using suitable examples, we discuss strategies for DSC curves. A second article to be published in the next UserCom will cover TGA applications. Water vapor sorption of product packaging using the ProUmid sorption test systems The shelf life of a packaged product, for example in the food sector, is often strongly influenced by the properties of the product packaging. An important factor here is the permeability of the product packaging toward water vapor. The ProUmid SPS and Vsorp sorption test systems in combination with special sample holders allow the transmission rate of water vapor through the packaging and the sorption rate of the packaged products to be determined experimentally. Thermogravimetry and gas analysis, Part 2: TGA-MS TGA experiments in combination with a suitable evolved gas analysis (EGA) technique not only provide quantitative information about the change in mass of a sample but also qualitative information about the gaseous reaction or decomposition products that are evolved. In this series of articles, we will discuss the possibilities that METTLER TOLEDO offer. DSC measurements of metals by DSC and TGA/DSC DSC measurements can be performed up to about 700 °C using conventional DSC instruments. If higher temperatures are required, DSC curves can be measured up to 1600 °C using the TGA/DSC. This article compares DSC and TGA/DSC measurements and discusses how quantitative calorimetric measurements are possible in the high temperature region. Measurement of the thermal conductivity of powders by DSC The first measurements of the thermal conductivity of powders  showed that powders can be an interesting alternative to vacuum systems for achieving good thermal insulation. Currently powders of different materials (ceramics or polymers) are used in packaging or for building insulation. On the other hand, the low thermal conductivity of powders entails serious risks in the production and manipulation of energetic powders intended for pyrotechnics or explosives. Knowledge of the thermal conductivity of powders is therefore crucial to avoid spontaneous ignition. Determination of the water vapor permeability of packaging materials High demands are nowadays put on packaging materials. For example, depending on the application field, the materials must provide optimum barrier properties toward water vapor, oxygen or odorants. In addition, there are requirements regarding tear resistance, transparency and compatibility with the contents of the packaging. In this article, we show how the water vapor transmission rate of materials can be determined using a sorption test system. Strategies for separating overlapping effects, Part 2: TGA The interpretation and evaluation of thermal analysis measurement curves is difficult when several effects take place simultaneously. A number of methods are available that can be used to separate overlapping effects and analyze them individually afterward. In this article, we discuss strategies for TGA curves using suitable examples. Detection of previously unknown menthol polymorphs by Flash DSC Knowledge of the polymorphic forms of an active substance is very important, especially in the pharmaceutical industry. In this article, we show how previously unknown polymorphs of menthol can be identified and characterized by Flash DSC. Analysis of an unknown polymer sample by TGA/DSC-FTIR The composition of unknown polymer samples can be quickly characterized by means of combined TGA/DSC-FTIR measurements. This article describes a typical example.